Without heat treating processes on the shaft ends, the center holes on both side will be reserve. The shaft ends could be easily manufactured to favored size. Standardized stock for general specification's thread length and length of blank shaft ends. The accuracy can be as good as JIS C5 and C7 grade and with standardized axial clearance for the reason that can be cost down and the price will be cheaper. By way of 3D Spline designed pathway for circulation system, and has enhanced the smooth circulation of ball ,that can reduce the wearing and increase the life of ballscrew. 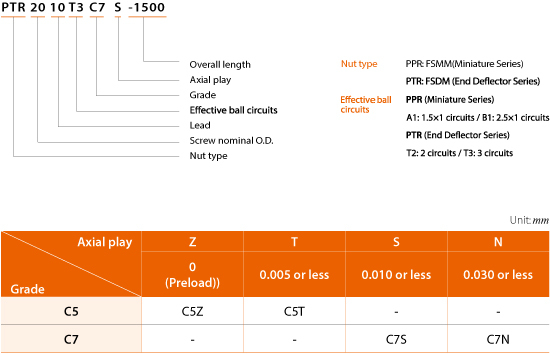 The ballnut diameter reduces 20%~25% substantially and the length of nut is shorter. The average and accurate ball circle diameter (BCD) through whole threads make the ballscrews to obtain the stable and consistent drag torque as well as to reduce the noise. The audio frequency is low and deep due to the designed of plastic circulation system.